I find it curious that despite the “positive” judgment, I cannot find a full copy of it on the Amway Blog and other pro-Amway sites.. Apparently neither AmwayWiki , where the judgement was posted last Friday, nor this site, the Truth About Amway, where there have been at least 18 pages of commentary (note: on old forums, since removed) since the judgement was handed down, including links to the AmwayWiki copy, nor Chuck’s Speaking of Amway blog, where he also highlighted the AmwayWiki post, are considered “pro-Amway”. 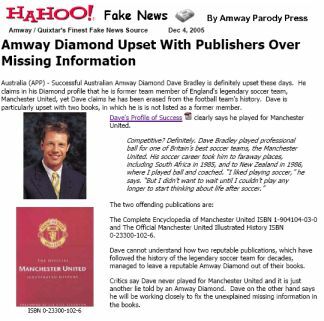 While Larsen is trying to claim this is ""parody", he clearly links to a real "Profiles of Success" article about Dave Bradley, a real Amway Diamond, he includes Dave Bradley’s real photo, and he includes information and a picture about a real book about the real football club, Manchester United. Clearly this is not legitimate "parody" and just as clearly, if the allegations are untrue, Larsen is guilty of libel – directly and publicly accusing Dave Bradley of lying about his association with Manchester United. Well, I did a little googling, and guess what I found. This page about Dave Bradley on the Doncaster Rovers official website. The page clearly states the Rovers purchased Dave Bradley from Manchester United, where he had been a player from 1975 to 1977. Last week we caught Scott Larsen making a fool of himself and unable to read the content of his own website and accusing Amway of "spinning" (ie lying) about what his website said – when it said exactly what they claimed. Earlier Larsen has been caught lying about Crown Direct Jody Victor, fudging articles about Founders Crown Ambassador Dexter Yager income, and deliberately leaving out information in a Wall Street Journal article on Japan’s Double Crown Ambassador Kaoru Nakajima in order to deceive, and last year. I caught him lying about what an illegal pyramid is. And this is to say nothing of the misleading "analysis" he presents on his website. Yet every day, thousands of potential Amway IBOs around the world google Amway, come across his website, and believe what he is saying. He is a disgrace. User SP75 in the forums was on the ball and has caught Amway/Quixtar critic Scott Larsen making a complete fool of himself (again). "If you read the page (amvio_uk.html Feb 9, 25), I only stated that DTI had a lot information on Amway. In fact, the word "investigation" was never used on my page." well, maybe I cannot read…. "UK Amway/Amvio Investigation"????? WHAT??? I N V E S T I G A T I O N ??? Isn’t this the word which was NEVER used on his page????? Scott, you are a liar! What else do you expect us to believe? Yup, definitely no "Investigation" mentioned there Scott – who’s the one who can’t read exactly Scott? And your own website? In fact, not only is it in the part I underlined, it’s also the actual title of the page. And let’s not miss the fact this supposed Amway "expert" doesn’t even know the European website for UK was AMIVO not AMVIO. SP75 has previously highlighted Larsen lying about Crown Direct Jody Victor, lying about Founders Crown Ambassador Dexter Yager income, and lying about a Wall Street Journal article on Japan’s Double Crown Ambassador Kaoru Nakajima. I blogged last year about him lying about what an illegal pyramid is. Amway UK & Ireland – Is this the problem? Scott Larsen and profitability – wrong again. Noted Amway and Quixtar critic Scott Larsen has a new post up last week about “profitability”. Now, the post actually has some good advice, for both individual IBOs and their upline. As noted on Beth Dornan’s Inside Quixtar Blog on the Quixtar Opportunity Zone, net profitability for IBOs should be a primary goal. What’s the point of being a platinum, or even a diamond, if you’re still broke? Profitability is a matter of getting income higher than expenses, and many IBOs do not properly keep track of either. It’s quite simple – treat it like a business, it works like a business. However when it comes to evaluating the distributor’s net financial performance, the individual Quixtar distributor is always alone. No “some” Quixtar distributors, no “most“, just an absolute statement of fact – the individual Quixtar distributor is always alone in determining profitability. The whole post in general implies that upline have very little interest in helping IBOs determine profitability. The problem is, this statement completely and utterly ignores the fact that for several years the Quixtar IBOAI has promoted a book called IBO Bookkeeping , by CPA Joe DePetris, and since 2005 they have offered the entire book online on the IBOAI website – free of charge! The book includes some template business plans, keeping track of income and expenses, and of course, how to calculate net profitability. Who is the IBOAI? Well, it’s IBO representatives from all sorts of lines of sponsorship and different IBO organizations. In otherwords – upline. Yup – these same upline that Larsen claims aren’t interested in helping you calculate your net profitability are providing free tools for you to do exactly that! So much for IBOs being alone. 1. the parts of a written or spoken statement that precede or follow a specific word or passage, usually influencing its meaning or effect: You have misinterpreted my remark because you took it out of context. 2. the set of circumstances or facts that surround a particular event, situation, etc. 3. Mycology. the fleshy fibrous body of the pileus in mushrooms. We humans, naturally enough, interpret the world through our own experiences. Some believe that learning from experience and then being able to share that experience through language, both spoken and written, is what truly delineates Homo Sapiens from other animals. The down side is we all suffer from what is called Cognitive Bias. We tend to give our own experiences greater weight than perhaps it deserves. We all do this, myself included. So any experience, any report, needs to be set in the right context. Who said it? What are their biases? Are they reporting their experience or something factual? How widespread is this experience? On various forums, Amway/Quixtar critics often accuse me of claiming peoples "bad" experiences never occurred. I've never done that. What I do often say is "I've never experienced that – this is what I experienced". A critics view of Amway/Quixtar is based upon their context, their experience. Mine is based on my experience. Ironically enough, while claiming Amway/Quixtar supporters like myself claim "bad" experiences don't occur, critics often deride supporters for giving their experiences, with comments like "yeah, yeah, It doesn't happen in your group … heard it before blah blah blah". What I think is hard for people to grasp is the sheer size of the Amway/Quixtar world. Without this understanding, the context is missing. So let's try to give a little context. If we look at Quixtar, last year there were around 9, registered IBOships. Ask anyone with experience and you'll find that most of those did nothing, and probably no more than 5% of them renewed. Now if we look Here and here at some statistics collected by IBO organizations, we find that out of 8 IBOships, in a growing, healthy organization there'll be 4 or so people attending functions. Now, not every organization is growing and healthy, and that 4 people may be only 2 IBOships if they are all couples. So of 9, IBOships in Quixtar, there's something like 45, people attending seminars. 45,! That's a big number. That's a VERY big number. In fact it's too big for me to grasp. Let's assume most organizations aren't healthy and growing. Let's assume only 2, people are attending seminars. When I point out to "critics" that perhaps their experience is not the most common experience, or perhaps not as widespread as they think, they'll often retort "I heard this taught at a seminar with 1, people!" 1, people is a big number, a VERY big number. But it's less than 5% of 2,. 1, people sitting in a seminar being told something "wrong" or against Quixtar rules or whatever is a lot of people. But it's still less than 1% of all IBOships, and it's even only a tiny number of active IBOs who are attending seminars. 1, seems a BIG number – but put it in context, it's not. Don't get me wrong -it's still a lot of people, and if people are being taught or told "the wrong thing", well, one is too many! Every IBO or former IBO out there, our experience, our context, is tiny compared to the reality of the Amway/Quixtar world. It's bigger than you think. WAAAYYY bigger than you think.